Gatorade: I love the stuff. I go through can after can of it. I used it at Ironman almost exclusively. It's convenient, tastes nice, and seems to work for me. But it adds up... so I have been scouring the internet looking for a decent recipe for making Homemade Gatorade, but so far all I have found is a lot of recipes that fall well short. Most common mistake: missing the potassium, or trying to make Gatorade healthy by removing salt or using a long list of whacky ingredients. When you are doing endurance sports for long periods of time (at least an hour), or in high heat. Any other time, it's nearly as bad for you as soda pop, if not worse with the high salt content. If you are not stressing your body for energy and electrolytes, you do NOT need Gatorade! It is NOT health food. All of the calories in Gatorade come from sugar. If you get the liquid form, it's Glucose-Fructose. If you get the powder, it's good old fashioned sugar (which is glucose and fructose!). Sugar is the key for energy. Those electrolytes Gatorade is famous for? The most important of them is salt. We get a lot of salt in our diets in North America, so unless you're going pretty far or its really bloody hot, you probably don't need more salt. Another electrolyte, you need it, Gatorade has it. Other Ingredients: Not important! Flavour and preservatives. You don't need something that tastes good and lasts long, do you? I didn't think so. 120 calories. 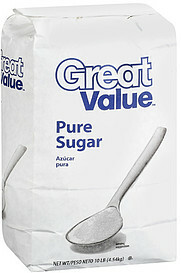 This is the same as the amount in about 3 tablespoons of sugar. 190mg sodium. This is amount of sodium in just 1/12th of a teaspoon of table salt! 65mg potassium. This is how much potassium there is in just 1/7th of a cup of Orange Juice. The real stuff, 100% juice, none of that Tropicana nonsense, no sugar added! Stir it up and that's it! It tastes pretty OK, not as good as Gatorade without the artificial flavours. If you want to add some Kool-Aid powder (the unsweetened one) or lemon juice to it, I won't be offended. Cost: cheap. Only ingredient that costs much of anything is the Orange Juice, everything else is almost free. And if it's a little hotter - just add a bit more salt and OJ, and bam, extra electrolytes. Also see my homemade energy gel recipe for something with more complex carbohydrates.